Kids 3 and under are FREE! This event is wheelchair accessible. Accessible ramp in the front of the church on 14th, and the venue has accessible restrooms. There is street parking and the venue is ~1/2 mile from the 12th St. Oakland City Center BART. 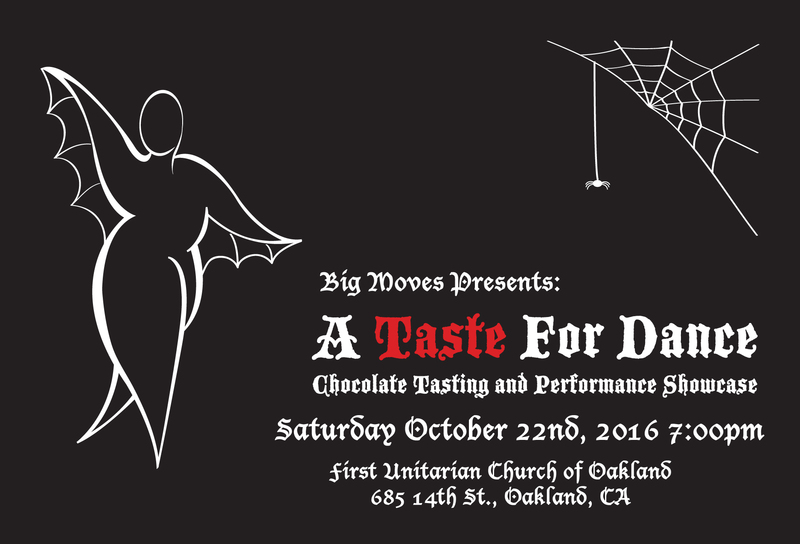 Big Moves presents our annual chocolate tasting and performance showcase, featuring our own emFATic DANCE and special guests: Bahiya Movement; Tigress Osborn; Shapes & Shades Dance Company; and Ifasina, TheHood AlKemist, Plus a Cupcakes and Muffintops fatshion show! Storyteller Ames Beezer, emcees! This low-key, family-friendly, body positive event is a wonderful way to incorporate community and warmth into your Fall schedule. Of course, we will also have an all-you-care-to-eat buffet of chocolates from local chocolatiers. Come in costume and show your Halloween spirit! Goody bags for the kids, too! We are so looking forward to seeing everyone in costume on Saturday night…Halloween fun times indeed! That said, please be mindful when you are dressing up and avoid being culturally appropriative, racist, transphobic, fatphobic, ableist, or otherwise hurtful with your costumes. A good round-up of the issue can be found here: http://colorlines.com/archives/2011/10/in_the_immortal_words_of.html Please also keep in mind that this is an event where kids will be in attendance. We appreciate your care and creativity! All proceeds from “A Taste for Dance” support the programs of Big Moves , a fiscally sponsored program of Intersection for the Arts, a 501(c)(3) organization. Have you ever wanted to strut your stuff down a runway, but been too intimidated by potentially unfriendly fashion audiences? Do you have some glorious clothes you scored at Cupcakes and Muffintops (any year!)? Now’s your chance to live your dream in A Taste for Dance’s Cupcakes and Muffintops Fatshion show, where you can soak in the appreciation while spreading the gospel of budget-friendly fatshion! If you’re the shyer type but would still like to help, consider volunteering for the event! You’ll get in free and help us to beautify the hall with spooky decor, set up and replenish chocolate, and help with cleanup. Ambiverts are encouraged to do both! Models and volunteers get into the event free, and most will be able to enjoy the whole show from their posts. If you would like to model and/or volunteer at A Taste for Dance please send an email to matilda@bigmoves.org. Founded in 2000, Big Moves is the only service organization in the world dedicated to getting people of all sizes into the dance studio and up on stage. Home to emFATic DANCE, our shows present a vision of a world transformed, where exciting performances can and do come from artists who resist the narrow dance-world norms. . ..and narrow dancewear options.